Architecture Bulletin 02: Essays on the Designed Environment [Timo Rijk, Aaron Betsky, Hans Ibelings, Winy Maas, Olof van der Wal] on Amazon.com. *FREE* shipping on qualifying offers. This second issue of NAi's biannual Architecture Bulletin comes in the form of a tribute to that institution's most recent director. 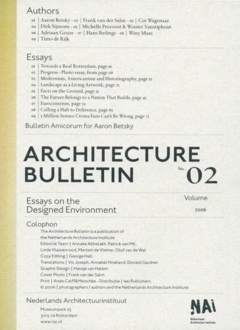 Buy Architecture Bulletin: Essays on the Designed Environment v. 4 2008 ed. by OLE Bouman (ISBN: 9789056626433) from Amazon's Book Store. Everyday low prices and free delivery on eligible orders. Published twice a year, the Netherlands Architecture Institute's Architecture Bulletin presents essays in word and image about the designed environment of today, yesterday and tomorrow: subjective arguments complemented by personal reflections on ar.